His personal work has a strong basis in reality but always flows into otherworldly aspects. He primarily works in graphite, gouache, and oils. Multilayered images arise in his work, in which the fragility and instability of our seemingly certain reality is questioned. Allen’s drawings directly respond to his surrounding environment and he uses everyday experiences and objects as a starting point for many of his pieces. Often these are framed instances and objects that would go unnoticed in their original context. By choosing mainly formal solutions, Allen tries to develop forms that do not follow logical criteria, but are based only on subjective associations and formal parallels; these are meant to incite the viewer to make new personal associations within his work. His work can be seen online or in galleries across the United States, Europe and Asia. 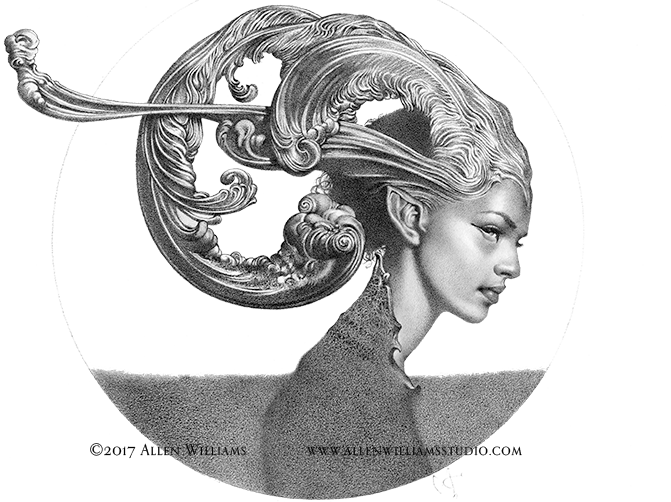 Allen Williams (b.1965) is an award winning illustrator, concept designer and fine artist. From a young age a pencil and paper with an escape and a refuge for Allen. Now nationally and internationally known, for over 28 years Allen has applied his talents to everything from illustration for gaming companies and book covers, to concept work for major motion pictures and television. His vision for such projects ranges from illustration to concept work and creature and character designs. His first book, both illustrated and authored by Allen, is titled “The Witches’ Kitchen” and was published by Little Brown Books in 2010 with a German edition released in 2014. Allen currently lives on the Gulf Coast with his wife, two children, and a dog. He is available for contract work, concept work, and gallery showings.